How do we deliver superior results to our clients while growing our team? We quickly learned that only a team full of A-level players can make that happen. If we have a team of superstars, then how do provide them with compelling short-term and long-term incentives? As a company, we must reward outstanding performance with clients as well as provide reasons to stick around. How do we grow the business, make the investments that are required for a thriving enterprise and actually turn a profit? The trickiest part of the equation is gaining traction with growth while remaining completely self-funded. ... and everyone can become an investor in PML ... and the more skin they put in, the more of a long-term interest in the company they earn. This diagram outlines the architecture of our compensation system. People are welcomed and encouraged to move towards the center over time. Not everyone does - some leave and others are happy staying put in the outer band for long periods of time. The outer-most circle and the inner circle are probably most familiar to readers. 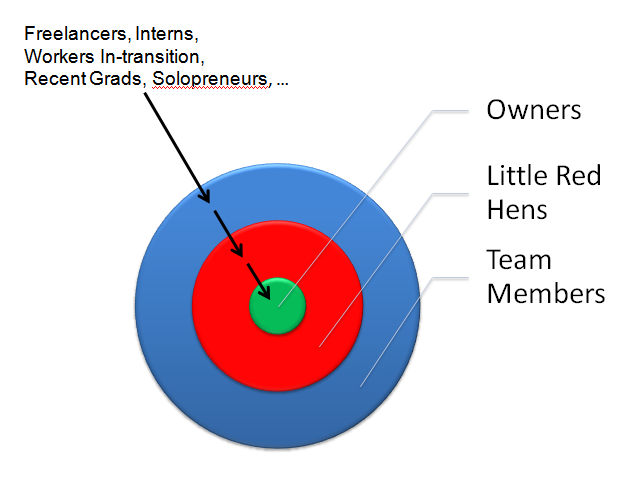 The outer circle represents team members. Team members get paid by client gigs. Before we start a new job with a client, we create a "Pricing Sheet" that outlines all project work-streams and then assign a role, an estimated number of hours, an hourly rate and a company margin to each work stream. Each team member gets to review the pricing before it goes to the client - so we know there is team-wide buy-in for delivering the project. When the client pays, the team member gets paid based on the pricing sheet. Since this circle contains everyone, everyone is a team member. The Little Red Hen circle derives its name from a child's folk tale about work eithic that rewards the hardest workers. Our Little Red Hen (LRH) system is a profit-sharing, dividend that is vested over a six month period. We use it to fund all of our "business building" activities that clients don't pay for including marketing, sales, finance, HR and IT work. Any team member who contributes to these activity is deemed a Little Red Hen. They are invited to our Monday team meetings (for which they get "business building" points). Since its difficult to predict how much operating cash we'll have each month, we need a flexible system that rewards people for their contributions. But what if I work hard on internal projects in August and we have a crummy operating income month? Then, just as I get pulled into a client project and put zero hours into internal projects, we have a windfall month! Do I get screwed in this scenario? You do not get screwed! Your points are accumulated into a six month table, with 26 columns (one for each week). At the end of each month, we tally up everybody's most recent six months of effort. Your total is added into the pie and you find out what percentage of this month's profit-share you will receive. If its a big month, you'll be rewarded handsomely for any heroic, business building efforts you had in the past six months. It has a natural vesting structure. When you start with us, you have to put in your dues... since after week 1 you will still have 25 weeks of zero balance. As a result, your monthly percentage will naturally reflect your tenure. After six months, you are on par with everyone. Every Little Red Hen is an investor in PML. The LRH provides a home for consultants who are "on the bench" and lets them earn LRH points for productive business building. Recently, we started using it to fund R&D projects. It provides for transparency on what everyone is spending time on. 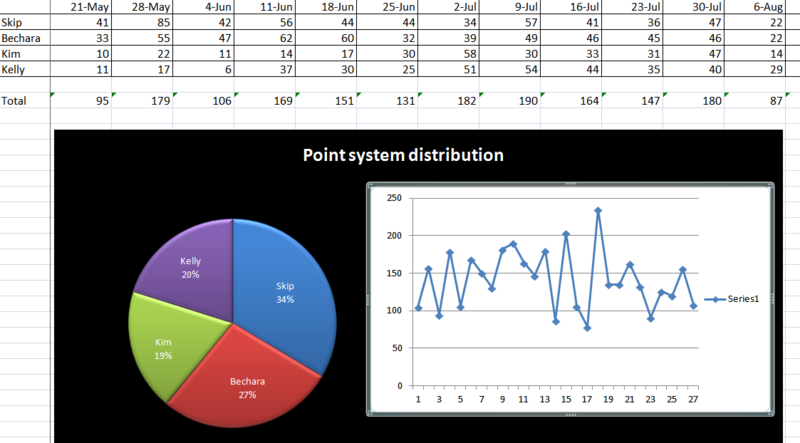 Every Monday, we all report our "point claims" - during which time any team member can challenge points being reported by another team member. It keeps us all honest - and we've documented a lot of policies and changed a lot of tactics through these discussions. The system scales up and down in accordance with what the business can bear. Its great for entrepreneurial teams building a service business. The Owners (inner circle) set the monthly profit-sharing pool based on current cash flow projections. Since the Owners distribution is a fraction of the LRH pool, the Owners have an incentive to make the LRH as large as the business will bear - which benefits Little Red Hens and Owners alike. The graph of weekly activity gives us a view into our "business building" investment and velocity. This turns out to be a pretty important metric that correlates with new business development, brand visibility and profitability. Finally, the Inner Circle is the circle of equity owners. This group receives quarterly distributions from an Owner's pool. As mentioned, these amounts are set as a fraction of the LRH pool over the last quarter. Owners receive distributions from the Owner's pool based on their fraction of ownership. The existing Owners invite new Owners from the pool of exceptional Little Red Hens who have expressed an interest and demonstrated their value to the company over time. This system is not for everyone. It requires participants with an entrepreneurial spirit and flexibility. Early on, a contractor-turned-team member is not likely to earn a full-time income. But the more willing they are to put skin in the game, the better they'll do. It naturally encourages the right kind of player (at least for Philly Marketing Labs). Note: while we do have some exceptions in our system (to accommodate special situations like interns or fixed-rate contractors), the majority of our business is built around this three tiered structure. I'm sure you have questions, so please drop them in the comments below and I'll do my best to answer them. If you decide to copy this some element of this system, let me know. We'll want to compare notes as you grow your company. Its public now - so have at it!